About three or so months ago, TS and I decided to embark on a fitness journey, resolving to exercise more and eat healthier. While we have no problems following the exercise regimen -- well, okay, okay, mumbles and grumbles are an everyday occurence at a certain time of the day, but it is doable -- eating the food prescribed by these fitness plans is another matter. We did try, making things such as souvlaki with lean pork and chicken, or a quinoa lentil apple salad. Gua Bao 刮包 ("Taiwanese Burger", or Pork Belly Buns) of our own. 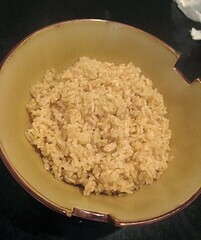 We try (or is it "tried") to eat healthier, cooking up a batch of brown rice sometimes instead of white. But really, come on, I don't understand how one fitness maven can tell me that whole wheat pasta tastes no different than white. "Don't even tell your family it's whole wheat pasta in your spaghetti: they won't know!" Well. Seems to me that it's wishful thinking to think that there's no difference, or that people can't taste the difference, especially between white rice and brown rice. I actually like brown rice! But, it's not a substitute for white. Simply put, a lot of food tastes better on white rice than brown. There's no denying it. 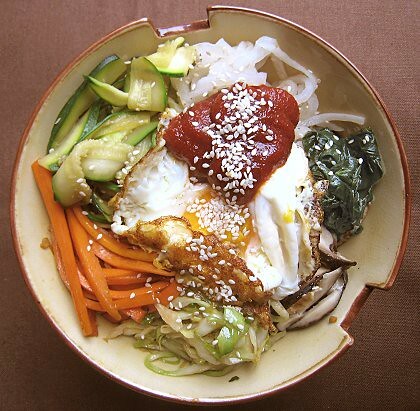 Sometimes, one can fudge it, as is the case with this brown rice bibimbap. 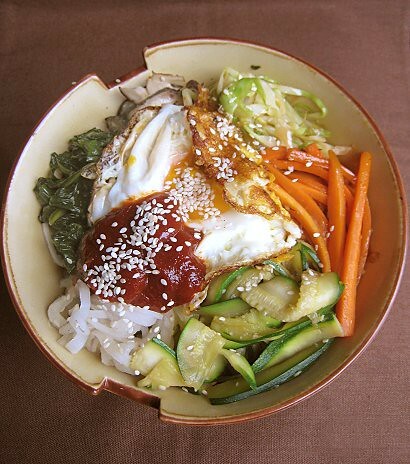 Unfortunately, we don't own any of those Korean stone bowls, so ours is just regular bibimbap as opposed to dolsot bibimbap. We were too lazy to cook up beef or some such thing, so we used all vegetables in our version. 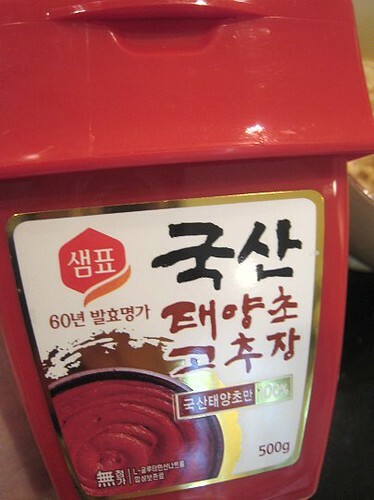 But first, the gochujang (Korean red pepper paste). There it is. Just buy one from the supermarket and you're good to go. 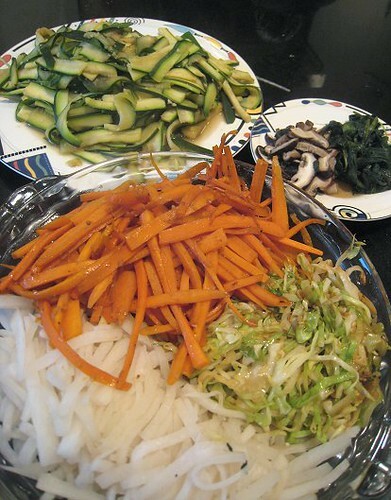 Making the dish is simply a matter of cooking your different components/vegetables separately on the stove, seasoning with garlic, salt and sesame oil, and sometimes a touch of soy sauce. I used various combinations of the above seasonings when cooking my vegetables. I have there tons of zucchini, carrots and daikon, some cabbage, and leftover spinach and mushrooms. 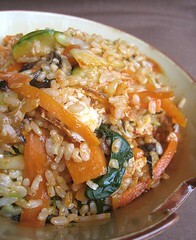 Brown rice in the bottom (cooked using a rice cooker), then the vegetables in neat little piles. I was too lazy too fiddle around with eggshells (separating the egg yolk from the white), so I simply fried a whole egg and placed that on top. 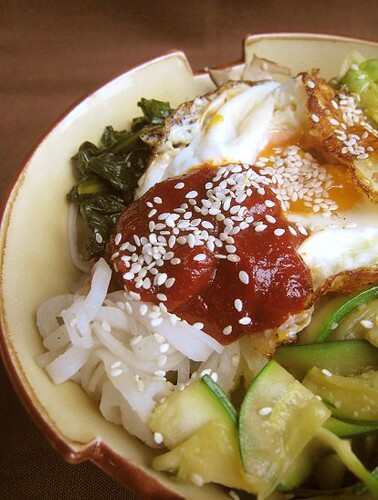 Of course, one mustn't forget the gochujang paste. I sprinkled a bit of sesame seeds on top as well. To eat, mix, mix mix! It seems like we've found an application for brown rice where it's allowed to shine as itself, not as a substitute for its whiter sibling. That's the key it seems to incorporating brown rice into our diet. Don't tell me there's no difference between brown and white because there is -- tell me to embrace the difference, as in "Vive le difference!" 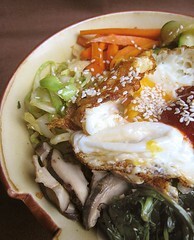 In this bibimbap, the slightly grassy, very nutty flavours of brown rice complement the seasoned vegetables perfectly. 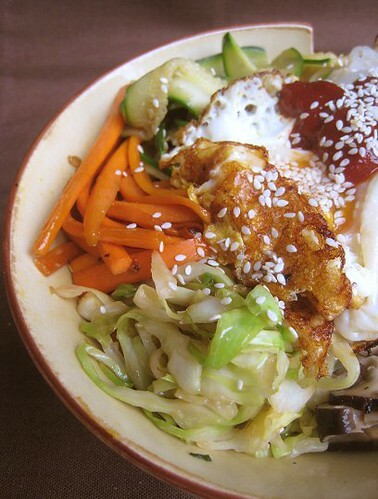 The gochujang paste ties everything together. 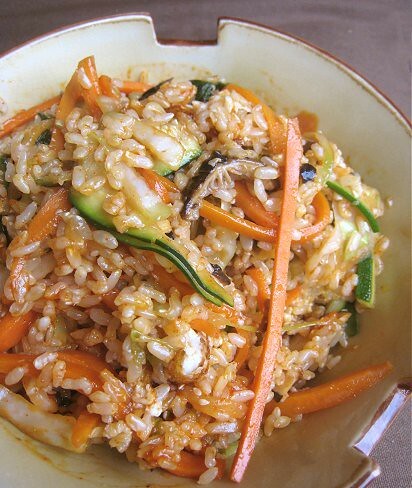 I loved the toothy brown rice, the slightly tender, still-crunchy vegetables, and the soft ooze of the egg yolk in every bite. I'm getting hungry. Korean food is one of my favorites. I agree about the brown rice. This looks soooo good! I just bought gochujang to make kimchi this week, and I'm blow away by not just the pleasant heat but the flavor as well. I added a bit to my eggs this morning and it was delicious. 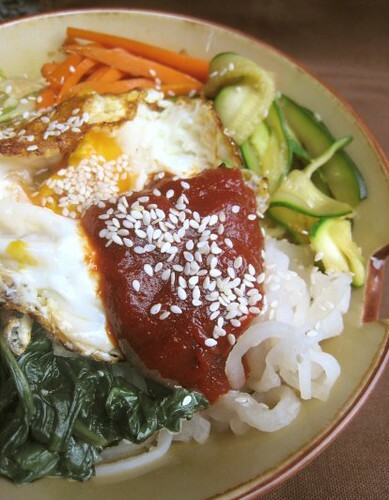 I'm new to Korean food and will definitely be checking out all of your recipes! This looks awesome! I had a craving for Korean last night and waffled between bibimbap and jap chae, but went for the noodles because I was feeling rather lazy. I know what you mean about brown rice. I absolutely ADORE brown rice for the nutty flavor and chewy texture, but there are times when you just *cannot* substitute. Glad that it worked out well in this case! Very interesting dish! So far from my usual cuisine but I am intrigued and would love to try it. 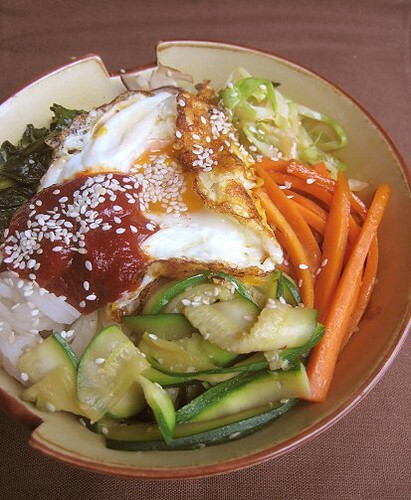 Nice looking bibimbap! 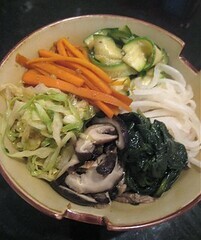 I like to use brown rice when making bibimbap as well. Thanks for visiting... and hope you like the stuff you make from here. This was so satisfying, I didn't feel like I needed to add meat to make it "heartier". "It is hard to be good... (sigh)"
We don't know too much about Korean food either, but bibimbap was not a tough sell at all. 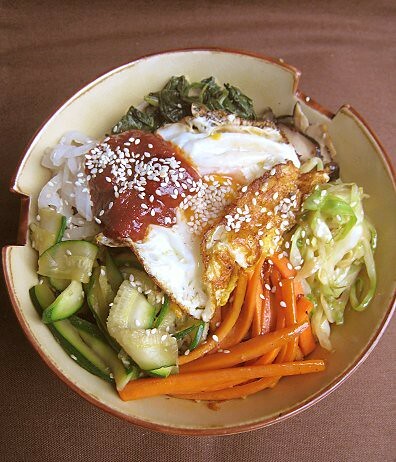 Even though there are lots of Korean restaurants around where I live, I haven't tried bibimbap! Must try it soon. I love that you used brown rice in this. i just saw a recipe for this in "Eating Well" magazine, so you have your healthy endorsement. i have to find the chili paste and this is on the menu for this week. i think i am going to use a grilled protein of some sort. yours looks delicious! Haha... us, actually "eating well". =D Thanks!